The Gulf Cooperation Council (GCC) member states met today in Riyadh to discuss regional developments, most significantly the ongoing crisis in Yemen. 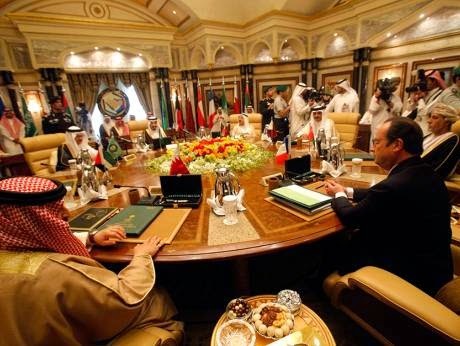 French President Francois Hollande became the first foreign leader to attend a GCC Summit since its inception in 1981. It was also the first summit for King Salman who took the throne on 23 January. New Saudi Crown Prince Mohammad Bin Nayef and Deputy Crown Prince Mohammad Bin Salman also were in attendance. Hollande has openly sided with the GCC states on major issues in the region, including the military intervention in Yemen and a possible military intervention in Syria. Hollane is also cautious about a final nuclear agreement between Iran and world powers and wants to balance any future agreement with strong guarantees to the GCC states. UPDATE: Saudi King Salman called on fellow GCC leaders to stand up to Iran, saying there was a need to confront an external threat that "aims to expand control and impose its hegemony," threatening regional stability and creating "sectarian sedition." Possible military intervention in Syria? You think France would go that far? Did he mention Iran by name? With Président Hollande, tout est possible, my friends ! Coming from a french-Iranian citizen such as myself, you'll find by asking around in Paris that I am everything but quite common on the issue. He achieved the all-time record in low popularity estimates, reaching an incredible 17% last year alone. Along the same lines, he got slammed from his own party members in an open letter during the last Gaza bombing campaign (including Foreign Minister Laurent Fabius, though being himself known to be very close to Tel Aviv) for being way too openly sympathetic exclusively to Israel and literally ignoring Palestinian populations bearing the brunt of the bombing, dropping their name in his many speeches he had while visiting Israel or receiving Israeli officials. Likewise, both opposition figures and members from his own cabinet criticized him repeatedly for following too blindly in the US footsteps and not even caring to hide it publicly, saber rattling against Syria in chorus with Obama and going against the recommendations of France's CIA, the "DST", explicitly declaring that he will wait for Congress' final decision to call on french armed forces to act or not. Oh, and I voted for him believing he would be our version of "Change", that would be the most miserable part all things considered. He has already cost France historically lucrative auto-market deals through by Peugeot and in the oil sector with Total, with Iran having recently renegotiated the terms for Iran Khodro much more in its own favor, and with Total yet to be named as a credible possibility to re-enter NIOC's pending projects. General Motors and Exxon seem to be the leading candidates to gradually replace them, while the White House pays lip-service to the french President for his good and obedient service, unconditionally aligned with American interests and posture towards the region. Every front page in every news outlet has been painting him as Al-Saud's best friend since yesterday, and this is just the beginning, dropping Republican values in the name of arms deals and paying a historic visit to the petromonarchs' capital, while shunning WWII victory celebrations because of Ukraine. Vive la France, vive la République ! This is how his remarks were reported by major news agencies. I can't read the original version. But based on what was quoted, the reference to Iran was unmistakable. The west should invest in the Iranian people. After the collapse of the Islamic regime the Iranian people want freedom and democracy. We know the west is against this and prefers to maintain the status quo by setting up Iran as the bogeyman of the region. The Russians are also happy to see Iran in a weak economic and military state. The Chinese are no better. But the Iranian people will prevail against all the odds and defeat the Islamic dictatorship and disappoint Iranzamins enemies throughout the world.